Promoting health and creating a better work / life balance. Maintaining your work/life balance is of increasing importance in the busy 21st century. This seminar is about regaining the balance in your life. You will explore your own pressure valves to understand the warning signs and explore practical ideas to maintain spare reserves. The ideas and tools can be used immediately and effectively. Stress management training usually takes place over a 1-day seminar. It includes a workbook for on-going monitoring of healthy stress. Test out your stress on the day with a 'Stress Biodot'. Health Seminars and Conference Presentations. Our training creates peak energy for your employees so they can reduce stress and be more effective. What you eat provides energy for your daily life journey and the stamina to keep going and be productive. Are you eating the 'best' food to create peak energy and enhance brain function? "If you exercise your brain you will positively influence your body, if you exercise your body you will positively influence your brain." Tips and ideas to make exercise part of everyday activity to raise your energy. Your environment can affect your energy and performance, influencing business profitability and morale. This workshop will show you how to create an effective environment that works for you, both in your work and home life. The workshop will explore the influence and interaction between people, buildings and the environment in order to enhance quality of life. "We have tried out some of the suggestions, the department not only looks different, but the staff seem happier as well." The mind-body connection underpins your health and wellbeing. The seminar explores how the mind-body connection underpins health and wellbeing. The seminar will unlock some of the secrets behind energy and explore the miracles of the human body to understand 'how your body speaks your mind' to create energy for action. Maintaining your work/life balance is of increasing importance in the busy 21st century. This seminar is about regaining the balance in your life. You will explore your own pressure valves to understand the warning signs and explore practical ideas to maintain spare reserves. The ideas and tools can be used immediately and effectively. Helping you create energy for action! 'The Six Pack of Health', is designed to provide key health messages for you to listen to in the comfort of your home or car. 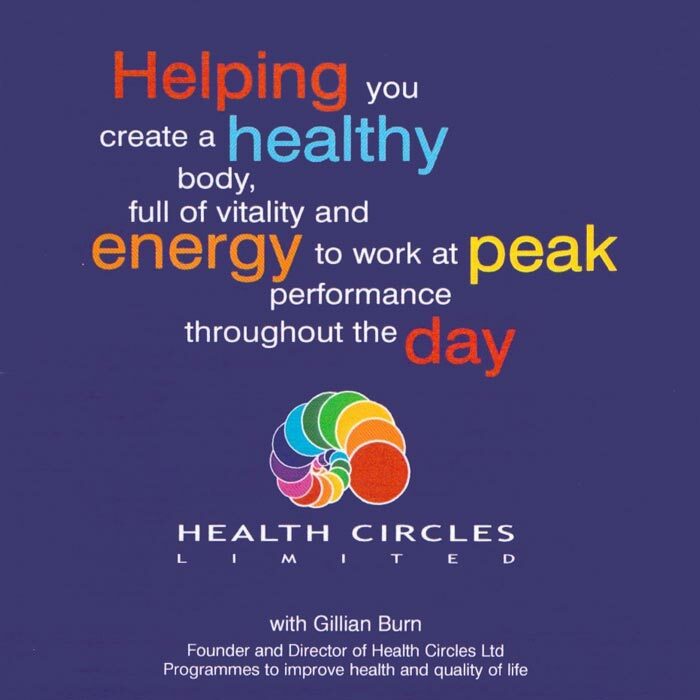 Helping you create a healthy body, full of vitality and energy to work at peak performance throughout the day. The programme also includes exercises to try at home, at work and when travelling. The key messages are presented in a series of health maps within a booklet to give a pictorial representation. We need to collect and process your data so that we can respond to your enquiry.